The lovely Robyn from Mrs D plus 3 invited me to take part in this latest blog hop, talking about why we bloggers write as we do. I've got a few things on the go at the moment. I've been meaning to start a monthly newsletter for ages, everything is set up in Mail Chimp and I've been collecting subscribers – I just haven’t produced the first newsletter - but I'm determined to get it out on 1st July. There’s an ebook in the works too – it’s a techie guide, but I'm not going to tell you exactly what – you’re going to have to wait to find that out. I like to add a new How-To Guide each month to the collection on the blog, so I've got two half- finished that I'm working on. Usually they will be guides on how to use a particular program, or a particular online tool. I'm open to ideas, so if there’s something techie that you’d really like to know how to do – just let me know. Apart from writing for Techie Mum, I am also a trainer, teaching courses in how to use computers and associated software. I've just taught my last class of the term today, so I've now got the school holidays to prepare for next terms classes. When courses repeat each term there’s not too much preparation, but next term I've got a new course in Windows 8, so I'm just starting on designing that at the moment, and, of course, Facebook is always making changes, so I need to check if my Facebook for Beginners manual needs updating. In America there are a quite a few technology blogs written by women, but in Australia the majority of bloggers in the technology genre are men who write about the specifications of the latest devices, the latest computer games and coding. There are a few blogs written by women that occasionally feature techie topics, but Techie Mum is aimed at families, with articles and reviews aimed at the types of devices and techie tools that Mums, Dads and kids use. Techie Mum started as a place where my students could get more information about the topics they were learning about. If there was some information I wanted to give them at the end of the course I didn’t want to have to post it out to them, so I would add links to the documents on the blog, where my students could download or print those they needed. I started adding articles about technology to the blog, and soon discovered I really enjoyed researching and writing about techie topics. The favourable comments I was receiving helped me decide to turn Techie Mum into a real blog – but still with a page where my students could go for their documents. 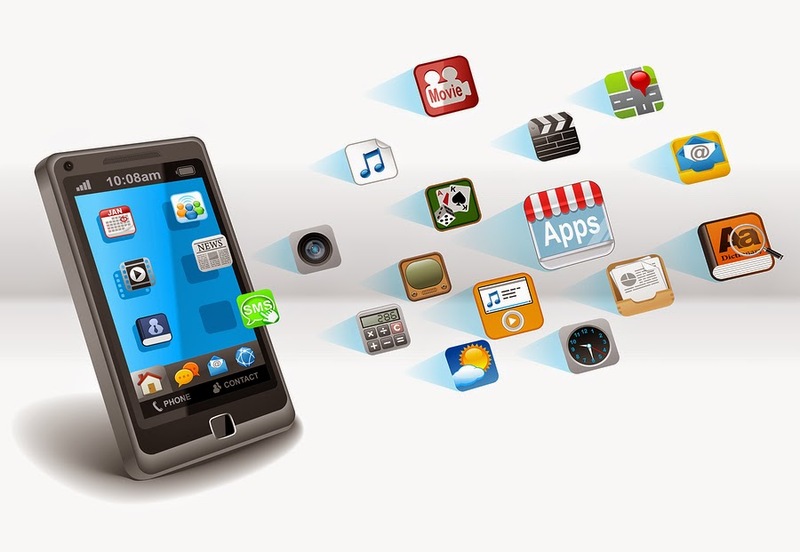 I have always loved technology, and love finding out about new devices, apps and online tools. Techie Mum is where I can share all the techie things I find – news, new apps and gadgets, and hopefully help my readers by answering their questions and solving some techie problems for them. I try to post at least twice a week, but as I'm not writing about something I'm personally experiencing or about my family, the process of writing each post can take a bit of time. 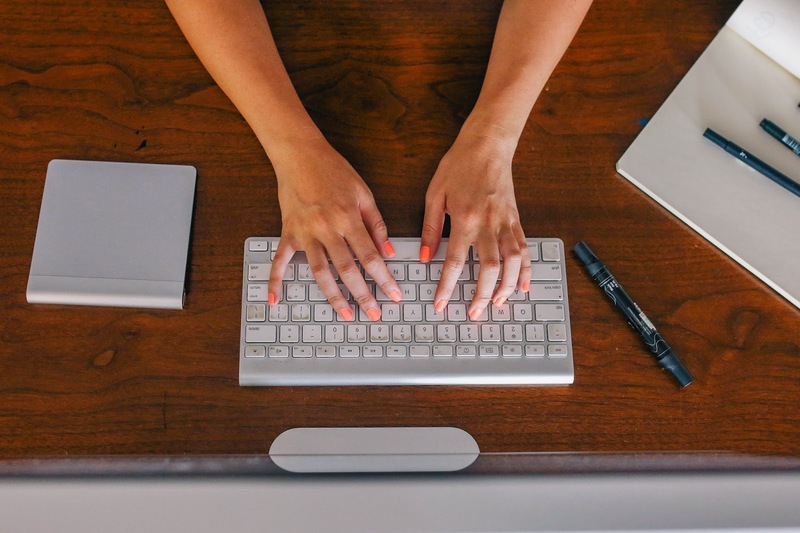 Usually the inspiration of what to write will be based on something techie in the news, a new gadget, or answering a question or problem from a reader. Because a lot of my posts are technical I’ll always research the topic, even if it’s one I know very well, just to make sure that what I'm writing is current and accurate. I’ll spend some time every day catching up on the latest technology news. Whenever I find something I’d like to know more about, write about, or keep for future reference, I’ll add them to Pocket. Because I've got Pocket on my PC, iPad and phone I can catch up on some of my reading wherever I am. If an idea for a blog post comes to me when I'm out I’ll usually jot down the idea quickly in Word on my phone, saving it to OneDrive, which means I can continue the post when I get back home to my computer. I've got a lot of half-started posts! I now need to pass you over to some other lovely bloggers, and next week you’ll be able to read about why they write. Jane from The Hesitant Housewife writes very honestly about her sometimes bumpy life, about being a wife, and a mum to a gorgeous daughter diagnosed with ASD. Her posts are so enjoyable to read, and I've found they make me really think and reflect on my own life. 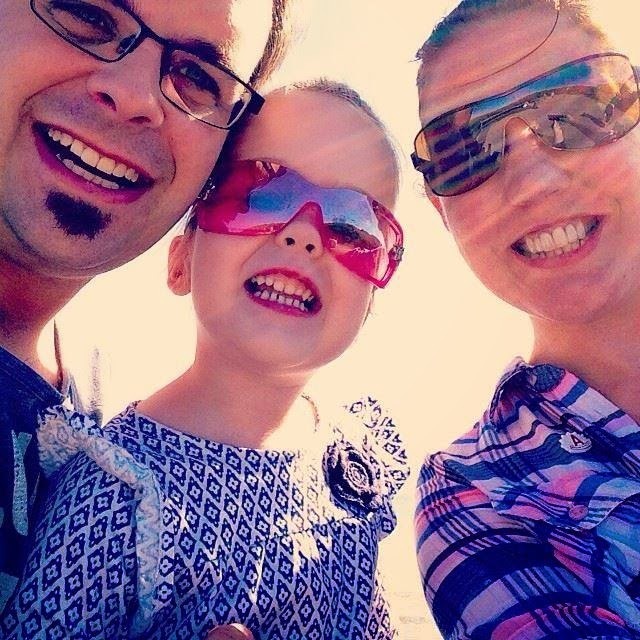 Holly from Simplify.Create.Inspire writes about her journey towards a simplified life, with posts about crafts, recipes, and family; but also really thought provoking posts and the dreaded work/life balance. Holly’s is one of those blogs that once you discover it, you end up spending hours reading through her old posts. 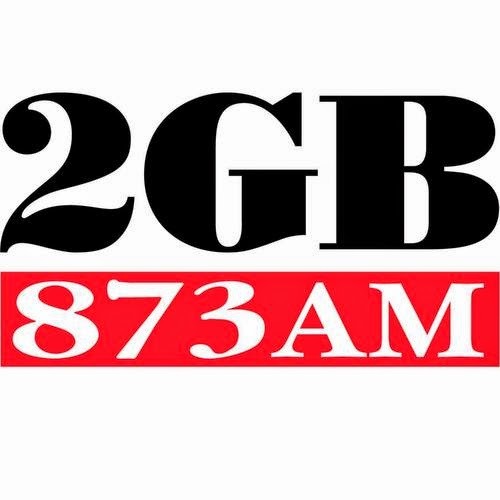 I was on the radio this morning – Sydney radio station 2GB. If you’ve just found Techie Mum from my interview with Andrew Moore – welcome. Techie Mum is where you’ll find tips, information and product reviews on the types of tech gadgets that families use, new apps and software for Mums, Dads and kids, and recommendations and advice on how to get the most out of all your family’s devices. When it comes to cyber safety I defer to the absolute expert in the field – Leonie Smith, also known as The Cyber Safety Lady. Is instagram safe for children? You can also find Techie Mum on Facebook, Twitter, Google+ and Pinterest. Take a look on my Home page for the links to take you straight to these sites. I hope you enjoy reading my posts, and I hope you will feel free to comment and ask questions if there’s something techie you need help with. Have you ever explored this blog? There’s more to it than just this page. Take a look at the Guides and eBooks page – that’s where to look if you’re after step-by-step instructions on how to use techie tools and software. There are two eBooks on there at the moment – Gmail Basics, and the new one – Microsoft PowerPoint 2010. 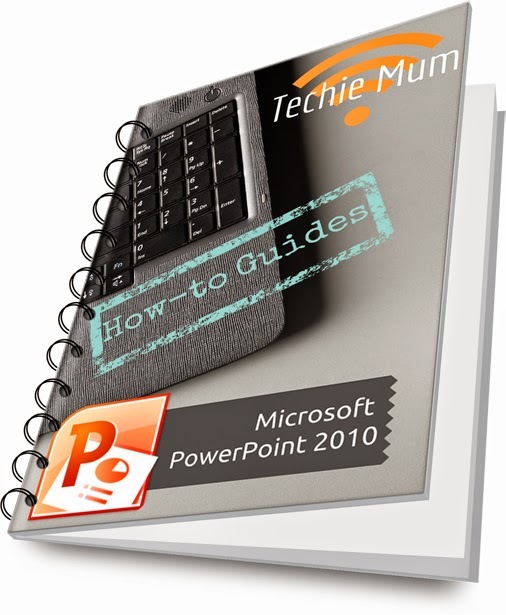 This new guide is suitable for anyone using PowerPoint 2007 through to 2013. There are slight differences between the three versions (2007, 2010 and 2013), but mostly to do with the number of picture editing options, designs, transitions and animations. The basics are the same for all versions. At the moment these guides are FREE for you to download by clicking on the title. This week’s app review is for the kids. 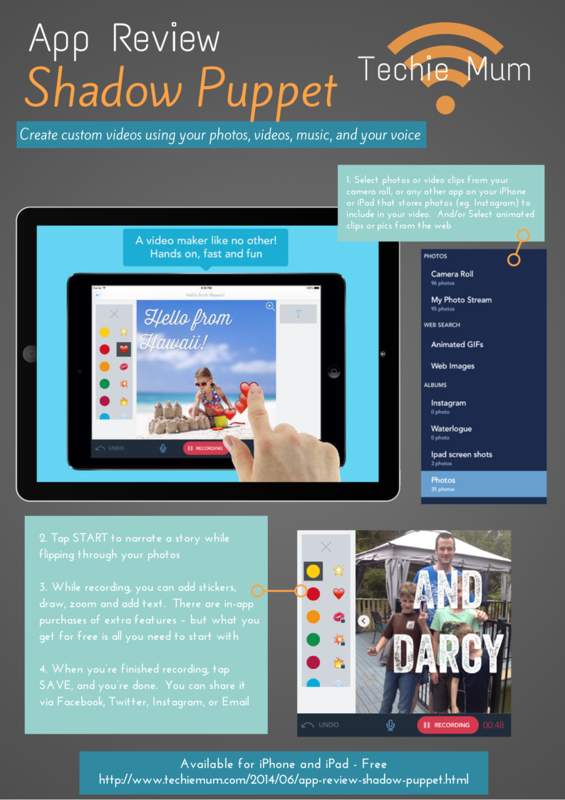 Shadow Puppet is a simple iPhone and iPad app that allows children as young as five to create videos by combining their own photos as well as pics from the web, animated gifs, video clips, music, text and stickers, and their own voice. If you’re using photos it’s not exactly a movie – it’s more like a slide show, but you can add animations over the top, like flying streams of stars, blinking lights and hearts, and text, which can be animated as well by spinning, zooming, fading in and out. You can add text to each slide as you go (the filming pauses while you add your text), or add the text to each slide before your start recording. There’s no limit to what your child could use this for – a holiday diary, showing off their latest drawings or school art works (just photograph it first with your iPhone/iPad and it can be added to Shadow Puppet from your camera roll), or an impressive school presentation. Access to the internet has become something we rely on, for shopping, banking, education, and communication. However, the more time you spend on the internet, the greater the chance of being exposed to cyber security threats and scams that put your personal information and your money at risk. It is essential that you keep up to date with the latest threats, and the Australian Government has made that easy with their Stay Smart Online Alert Service. It’s a free subscription based service, where you can choose the topics you want to receive email alerts about – software updates, social media scams, online security issues and the Stay Smart Online newsletter. You’ll also receive general tips on how to stay safe online. If you suspect a scam, whether that is from an email or phone call you've received or something you've come across while online, visit the SCAMwatch website to help you confirm whether or not it is safe. SCAMwatch is run by the Australian Competition and Consumer Commission (ACCC) with the aim of providing a place where consumers and businesses can learn how to recognise scams, and avoid and report them. 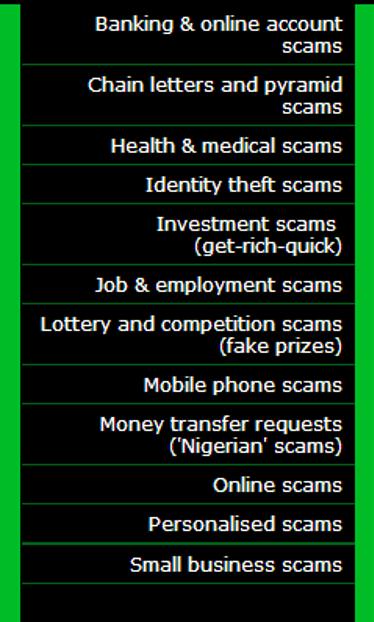 When you visit the website you'll see links down the left side of the screen where you can find information on particular types of scams - just click on the category you need to see if what you've found really is a scam. Sign up for the SCAMwatch alert service and you'll receive an email when there's any increase in activity of a particular type of scam, or when a new scam is detected. This week is Stay Smart Online Week, an Australia-wide initiative to educate Australians on how to best protect themselves online. The theme this year is security on mobile devices – On The Go. Our phones and tablets are becoming a normal part of our lives – we rely on them for so many tasks while we’re out and about. But it seems that almost every day we hear of the risks to our children when they’re online, but what about the benefits to our children of living in a connected world? To coincide with Stay Smart Online Week, Trend Micro, a leader in internet security, has launched the What’s Your Story competition, aimed at encouraging children to share their positive experiences about using mobile devices and the internet. What do you enjoy doing On The Go on your mobile device and how do you do it safely? Include any advice you can offer others too. The competition will run until 13 July and there’s the chance to win iPads or iPad-Minis and more. Entries can be submitted on this site from 16 June. Your kids could even enter as a school or classroom. Make sure you read all the conditions before your children start creating their entries. Once the entries start rolling in the video entries can be viewed here and your child can vote for their favourites. One of the ways you can keep your children safe when they are using their phones or tablets is with mobile security software. Trend Micro’s Mobile Security software provides advanced protection and privacy for Android and iOS devices by guarding against identity theft and viruses, blocking dangerous websites, protecting their privacy on social media, and more. 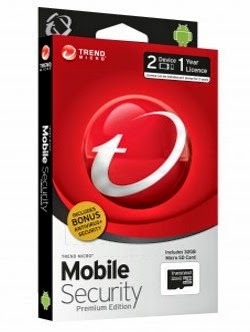 To celebrate Stay Safe Online Week and the What’s Your Story competition, Trend Micro would like to give one of my lovely readers Trend Mobile Security software. Submit your entry in a comment at the bottom of this post. The winner has four days to reply, otherwise the prize will be redrawn. This week is Stay Smart Online Week. This is the seventh year it has run, although it was previously known as National Cyber Security Awareness Week. The aim of Stay Smart Online Week is to help Australians using the internet – whether at home, the workplace or school – understand the simple steps they can take to protect their personal and financial information online. The focus this year is on mobile security – On The Go. All this week I’ll be posting about online safety. Pop over to Techie Mum on Facebook for links to lots of information and articles about keeping you and your family safe online. Come back to the blog tomorrow for news of a great competition and a giveaway.